Global Warming: The Incompetent Politician's Excuse? | Watts Up With That? Global Warming: The Incompetent Politician's Excuse? If you believe warmist claims, then this abandoned house in Delray, Detroit, was likely overwhelmed by global warming, just like the sewer, causing occupants to flee as “climate refugees”. Detroit blaming global warming instead of poor infrastructure maintenance. The US City of Detroit is currently in the midst of a crisis – a massive rainstorm has overwhelmed the city’s sewer system, causing extensive flooding. However, Craig Covey, spokesman for Oakland County Water Resources Commissioner Jim Nash, has blamed global warming for the floods. If the people of Detroit accept the explanation that global warming is to blame for the disaster, then nobody will be looking to blame the politicians who are responsible for maintaining the city’s waste water system. Graph by Tony Heller from original NOAA data. I wonder how well Detroit is keeping up with keeping the storm sewer system clear of debris? With so much of the city in urban decay, extra debris in the sewers is almost a given. One thing in the news recently about Detroit is the inability of many residents to pay their water bill. News media seems to have missed the connection in their own headlines. Note the yellow highlight, almost half of their budget is in “doubtful” aka unpaid accounts. Surely maintenance suffers when such a situation occurs. August 13, 2014 in Alarmism, Rainfall, Weather. Funny… I live about 40 miles (as the crow flies) from Detroit, and despite getting the same storms that they did, we didn’t have any particularly bad flooding. Couldn’t be that my neighbors actually pay their property taxes, and our elected officials aren’t corrupt beyond belief, could it? Bingo – same as here. One heavier than usual storm coupled with slightly above average snow pack in the mountains (caused by cooling, by the way) and we have record floods that have never been seen, ever. Unless you look it up and find worse ones in the 1920s and 30s. And there have been major reports every decade since then telling the city that they HAVE to dredge and berm the two major rivers that intersect in the middle of a major city… or else. I feel like I live in a city of robots programmed to accept “climate change” as the “obvious” answer to everything that has happened here almost ever year, or at least every decade. All cities and town counsels are benefiting from this charade, they can waste money on stupid crap that nobody needs or wants, and scream “climate change” when their failure to do their jobs becomes too obvious. The 1967 riots happened because it was windy. Kilpatrick was put in prison because it was humid. Nearly 1.5 million residents have fled the city because of the dew point. well I am not on city water here but where I am in maine this year it pretty much has not stopped raining since april. yeah slight exaggeration but due to rain I have not yet been able to fully mow the lawn in one sitting. and my property not flooded, my roads are ok, including the one I maintain. Absent yet from both analyses is the real cause of the problem. The financial elites chose to abandon Detroit to decay so as to maximize exploitation of labor by offshoring jobs. No, that’s not the fault of local government, which actually offered obscene incentives to keep jobs. Google Poletown. No administration can keep up the infrastructure of a city when the tax base is gone. Furthermore… Craig Covey might want to blame climate change, but I’d sooner blame the miscreants who think that the highway is their personal trash can when the storm drains get clogged and back up water onto the roads. The term is outdated by overuse, the actuality remains the same. If a tree falls in a forest and everybody saw it and says so, did it happen more than once? The downturn in the economy hits everywhere and with nearly equal force from the middle incomers down, and in every state and territory. The replacement of decent wages with service jobs will not get us out of this quagmire. The replacement of town and city sized risky private companies with investment based stock holder international corporations who depress their overhead in order to keep stocks up is a comeback damper as well, not to mention regulations. And to tell you the truth, I don’t know how we are going to get out of it. Climate change is the new generic code for extra money. It is used by Jerry Brown in California for drought relief money and a presidential visit and it will be used in Detroit for flooding money and general supplemental aid justification. Willful neglect of taxpayer funds is like a cancer and is unlikely to go away on its own. would imply that there are competent politicians. This assumes facts not in evidence. Sounds just like “our algorithm is working as designed”. The rainstorm and the ensuing flood is a godsend for warmists in the Detroit area. They had been screaming for the last decade that water levels in the Great Lakes were lower because of global warming. Those claims were discredited this year as water levels have risen to normal or above normal. Now they can talk about this rain event, which used to happen frequently in the 1980s, and I am sure will happen again. It will be interesting to see how the outcome differs in Baltimore or Long Island, which are suffering from even bigger deluge. Oh boy. It’s sad how distorted stories get when they become national news. First off, no part of Detroit is in Oakland County. Second, yes, this was, by all available climatological information, a 100-year storm for the Detroit metro area, especially given that the entire event was really only 6 hours in length, with the flooding rain really occurring over maybe 2 hours. The extreme totals were highly localized over a specific area pretty much smack dab over Detroit and the closest cities. Some cities bordering Detroit (and where the worst highway flooding was) got over 6″ of rain in a few hours. 6″ is nearly 20% of annual average precip for this area. The only really comparable recorded event for Detroit occurred on July 31, 1925. Still sounds like a 100-year event to me. Don’t know about “100-year storm”, but I do believe 100-year FLOOD is an outdated term. Although localized these problems are anthropogenic in nature and caused by land use changes resulting in more run off, new bridge footings which restrict river flow, levies, and lack of adequate dredging result in backup of rivers. In another century I lived in the New Orleans area for 10 years and experienced several 100-year floods. This is exactly the same as the flooding in South-West England – blame it on global warming when it was actually a deliberate policy of not clearing the flood drains. Just like the floods earlier this year on the Somerset levels – although rural not urban. Blame climate change and not the woeful level of river and drain maintenance over the last 25 years. If climate change was a human being, it could, in some nations, successfully sue for defamation of character. If there is data on the Detroit weather station’s rainfall record, it should be posted–ideally as a chart. Also, if there is historic data on money spent on sewer maintenance, that should be posted. Hopefully this flooding partially flushed out some of the blockage. Note the location of the extreme totals are directly over Detroit. This happened courtesy a deepening surface low riding up southwest of Detroit which caused an area of intense rain to form for several hours just east of the dry slot. It was a system with fall-like dynamics but with the more typical summer airmass and moisture content. The 1925 event happened in a similar setup. Strong baroclinic lows are not typical in early or mid-August and the jet stream is usually fairly north of here during summer. It’s entirely another to fish out what percentage of cash that was given for sewer maintenance actually went for sewer maintenance, and not for kickbacks and bribes. From Katrina to Sandy and now this year even thunderstorms we see the results of decades of incompetent governance hiding behind climate as an excuse for the failures of the government workers and leaders to do their basic jobs. Detroit’s use of this excuse, when their incompetent leadership has literally destroyed the city, may wake people up. It is time to stop allowing the climate fear scam be used to hide corrupt incompetence. So the system was supposed to back up and flood? Interesting design. The weather station at the Detroit Airport reported over 4 inches of rain in 6 hours. According to Rain Atlas 14, this is, as the article stated, around a 200 year event. Although design practice varies by local ordinances, generally the practice is to design urban stormwater systems for a maximum 2 year to 10 year event, depending on the value of the district. No urban stormwater system will carry a 200 year event, regardless how well maintained the system is. In extreme events such as this there will be localized flooding. The flooding in this event is due to the magnitude of the event, NOT inadequate maintenance, NOT poor design, NOT poor construction. Maintenance, design, and construction might be contributing factors, but flooding in an event of this size is inevitable. In the true sense of the term “climate change,” extreme flooding events are consistent with a change towards cooling as evidenced by what happened in Europe when it entered into the Little Ice Age. Off the subject a bit but…..this Global Warming and its power…..??? Had to take the wife to Dr. over in Dallas, in the waiting room the mag. rack. Keep in mind this is in “conservative Texas” with Rick Perry as Gov. who appoints the people who run Texas Parks ect. to include who runs this mag..
http://www.TPWMAGAZINE.com or http://www.tpwmagazine.com not sure which they have it in all caps on the mag cover. Great stuff on the trip of the birds to Brazil and back to Texas, good info…. on page 49 right side of page…. “They now suspect tat climate change is a major culprit in the bird’s decline, and their last research focuces on whether the birds can adapt. The spring of 2012 was the hottest on record, but purple martins did not adjust their arrival time in North America, as some shorter distance migrants do. This means they arrived late for the advanced spring…..
Gotta add a comment here as I live in SE Michigan. Most of the news reports about flooding are concentrated in the suburbs north and west of Detroit – Ferndale, Berkley, Royal Oak, Warren, Sterling Height, and Dearborn and Allen Park to east. These local municipalities maintain their own water and sewer systems that tie into the Detroit water and sewage systems, and charge their own fees for service and system maintenance. The storm was unusual, dumping 5-6 inches, most of it during a few hours in the afternoon, in a swath from Detroit to the north, while I live about 30 miles northwest and got 2.75 inches in the rain gauge. I live in a very well managed township and we would have been flooded with this much rain in such a short time. This has always been a problem for Detroit. Three times as many people (wealthiest) live in the suburbs, they depend on Detroit but pay no taxes. Not a hard math problem. On the corporate side, allowing CEO’s to sit on one and other’s boards of publicly owned corporations to approve the outlandish compensation packages for themselves needs to be banned. This includes the golden parachute deals they get when they finally leave after screwing the company and stockholders into the ground. On the government side, the jobs are just too sweet and attract greed and slime rather than public service minded individuals. Cut the pay and benefits there and things might improve. Just removing the very high security given many politicians and you could get rid of the cowards, at least. Of course none of this will ever happen with the politicians and corporate fathers with hands in each other’s pockets. But, as usual, one can follow the money to the answers to most problems in this world. MJ Wise is correct that Detroit is not in Oakland County and that the rain event was unusual. Anthony was correct to point out that Craig Covey’s relating a 100-year event to global warming was idiotic and not supportable with any actual data. However, the piling on about Detroit and its property taxes, sewer systems, and corruption seems unnecessary and off-topic for WUWT. There are a multitude of problems that declining cities face – from an inability to afford adequate police and fire protection, inability to fund infrastructure improvements, the poor health of its aging citizenry, and contempt and ridicule from those more fortunate and (often) far away. What Detroit is facing is not that different from economic collapses faced by many cities over the past 50+ years – Newark NJ, Gary IN, Flint MI, Youngstown OH to name a few. When the jobs go, the people leave and the city struggles to survive. The problems are the same whether the climate is benign or hostile. How can the system work as it’s supposed to when scrappers have stolen the copper? In some cases, the pumping has been slowed by power outages and theft. Cross said MDOT has discovered several locations where thieves stripped out the valuable copper pipes from some pumping stations. Because those stations are used only when needed, they are not staffed 24/7. MDOT was unaware the copper had been removed — until now. Cloaca Maxima is part of the sewer system the Romans built in ancient Rome. Still working. 100 year events; page 26; 4.46″ for 6 hours, 5.01″ for 24 hours. The current event was 4.57″ over “several hours”. The last event of this magnitude was 4.74″ over several hours 1925. Looks like this was right in the 100 year wheelhouse. We live in the western UP of Michigan, more than 600 miles from Detroit, but Detroit news frequently makes the local radio broadcasts. Detroit’s “flooding” was discussed this morning. Not widely reported were the large number of inoperable storm/sewer system pumping stations… inoperable because of copper (wire) theft by the locals. Copper theft in this area has a long history, but usually it’s the looting of vacant buildings’ wiring, and lighting along highways & interstate bypasses that are hit. If you’ve driven through the Detroit metro area at night the last couple decades or so, you know what I’m talking about. The thieves steal copper wire and cabling and sell as scrap copper to metal recycling centers. I guess the heavy rains have now highlighted the fact that thieves have also been hitting the pumping stations. Why would you design a system to cause flooding? Maybe all the pavement and concrete roads had something to do with it. How about 30 years of mayor Coleman Young and his cronies? No one can undo that damage. One of the reasons politicians cannot accomplish anything productive – ever – is that they have this mysterious compulsion to seek to blame problems on somebody else rather than to seek solutions. As a practicing meteorologist I can tell you localized heavy rain events occur frequently. Most of them happen away from larger cities. By happenstance this synoptic event took place over a decaying city. These idiot politicians should be tarred and feathered. Unfortunately they get away with it because we have a populace that is scientificically inept. Fifty years of Democrat control of detroit, with all of their concern for the poor, seems to have done wonders for the city in so may ways. What is that definition of insanity? “Doing the same thing over and over again and expecting a different result”? I guess that goes for voting as well. JohnWho – you don’t need a /sarc tag for that statement. It’s unfortunately all too true. Welcome to the socialist utopia. We live in the western UP of Michigan, more than 600 miles from Detroit, but Detroit news frequently makes the local radio broadcasts. Detroit’s “flooding” was discussed this morning. Not widely reported were the large number of inoperable storm/sewer system pumping stations… inoperable because of copper (wire) theft by the locals. I hope an intrepid reporter will check this out and nail it down, one way or the other. In addition to many residents being too poor to pay their bills, Detroit is suffering from significant population loss. This results in both loss of general property tax revenue and municipal utility revenue. Given Detroit’s dismal financial state, it’s no surprise that they can’t properly maintain their storm drain system. It’s also no surprise that politicians and bureaucrats want to make sure blame falls anywhere but on them. It wasn’t the mythical financial elites who drove those jobs out of Detroit. It was the unions and govt that created the situation that it was too expensive to stay in Detroit. Tell me, do you deliberately shop at the most expensive store in town? If not, why do you complain when companies do the same thing with their expenses? First off the “decent paying jobs” only existed in the first place because WWII devasted every first world country except the US. It was inevitable that the rest of the world would eventually recover and start competing with us again. It was also inevitable that 3rd and 2nd world countries would not be content with their poverty and would seek to become 1st world and to compete with us as well. Looking back at the data and writing down the numbers this time, the Detroit airport recorded 4.06 inches in 6 hours. I did not look to see if this was the peak 6 hours during the storm it was the largest 6 hours added up by NOAA’s report. That seems of small consequence. The time of concentration for cities I work with, a drainage area of a couple square miles, is typically around 6 hours, so 6 hours would be a critical design time for the storm systems. Higher in the system, the time of concentration would be shorter, and the more intense intervals in the storm would be more important. Tech paper 29, that you cite, was published in 1960 and considered precipitation data through approximately 1950. It has been superseded at least twice, most recently by NOAA Rainfall Atlas 14, which considers data through 2012. Atlas 14 reports a 100 year, 6 hour rainfall of 4.14 inches, so this was around a 100 year event. As a 100 year event, this would exceed the design capacity of the system. It would of course be a remarkable coincidence if the Detroit Airport was located at the area of peak rainfall: it is likely that elsewhere in the City there was more rain. My conclusion remains that the flooding is because of the magnitude of the event, not faulty design, maintenance, or construction. There isn’t a metropolitan area in the US which can handle that much rain in that short period of time without at least some flooding. It’s the land-use, stupid. Definitely anthropogenic – if there is no money for maintenance, i.e. most people don’t pay their water and sewer bill, it will be worse. Land-use, not climate is to blame. Though most extreme weather has not increased in recent decades(some types have decreased) extremely heavy rain and flooding has gone up. Was this weather event linked to warmer global temperatures or climate change? The actual weather pattern at the time did not feature anything that was unusual and in fact, was related more to a pattern in the area(and the entire Midwest) that was connected to that area’s cooler than normal Summer, especially July into early August. It would make more meteorological sense if one were trying to tie this to global cooling(I am not doing that or intending to imply it). What are the facts regarding Detroit’s historical weather and extremely wet months? As seen from the link below, out of the top 20 wettest months for Detroit since 1876, only 1 month in the last 25 years, May-2004 made it. Flint had several wettest months ever in recent years, but a big reason for that is that records at Flint, like Jeff Masters life in the Detroit area, don’t go back far enough to capture equal or greater events. Do you want to pay to build a storm sewer system to drain any eventuality? It could be done, but it may double or triple the cost of construction, which would have to be paid for either by your taxes or in the cost of the lot you purchase. The amount of impervious area is a factor that is explicitly considered in determining the design flow. Capital Gang make it the second wettest. Trends at nearby USHCN stations show no increase in frequency/intensity of extreme rainfall, and at nearby Mt Clemens, the wettest day was in 1968. We also need to recognise that temperatures in Detroit have been 2 to 3F below normal for the last month or so. Maybe that has something to do with it! Faulty design and construction would have shown before, at least every decade, and would have been common knowledge. Faulty maintenance could have make it worse, of course, but you don’t need it to explain what happened. The climate literature on rainfall generally indicates an increase in frequency of intense rainfall events. 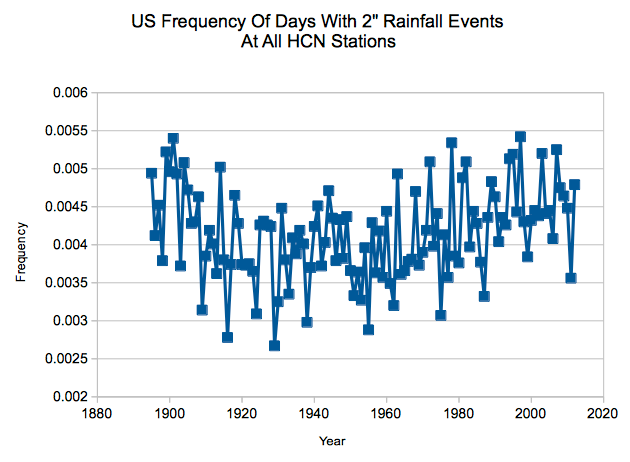 A typical study finds 1 of every 6 stations having a statistically significant increase in intense events, and on that basis concludes that more intense rainfall is generally increasing in frequency. That seems to me to be concluding too much, with too much certainty. The studies also do not report the magnitude of change. I took the rainfall data from all Iowa reporting stations (110 stations) and tested the daily rainfall separately for trend in frequency and trend in size of event since 1970. There was no trend in size of event: as many stations show a decreasing size of event as show an increase. Few stations have a significant trend either direction. In frequency of event, few stations show a statistically significant change, however most stations show an increasing frequency of intense events, though not statistically significant. The change in frequency is such, however, that typically there would be one additional 3 inch (and over) event in 30 years, one additional 2 inch event in 15 years, and one additional event over 1.25 inches every 2 or 3 years. These are not changes of any practical significance. I conclude that for Iowa, despite the literature findings, the trends are of neither practical or statistical significance. Maybe when they update the database again it will look more like the ’61 model. Any idea when the last major storm drainage project was done in Detroit? You are partly correct but the fact that 24 hours after the event, flooded freeways were still not pumped out is clear evidence that you are partly wrong. BTW, you are also partly correct on Detroit not being at the exact center of maximum rainfall, apparently there were reports of 6 inches at some places, however my wife flies back and forth in between here and Detroit 2 times a month and has a car parked at the airport that she was concerned about. They had to move it to higher ground. They did get hit with the most intense of the rain making storms and the reading from their instrument was a pretty good gauge of a narrow southwest to northeast corridor of similar amounts that nailed the center of Detroit and some suburbs. Not to trivialize this 1 in a 100 year type rain event for Detroit but here in Evansville IN, in the past 25 years, I’ve recorded close to a dozen similar events in the last 25 years, including 8 inches in less than 6 hours back in the mid 90’s. This is partly because we are closer to the Gulf of Mexico. We have extreme flooding, especially on the Southeast side from every heavy rain event, some that produce less than the rain that fell in Detroit. We are all paying an additional 35% on each monthly water bill(listed on the bill as “mandate”) to fund a replacement of the aged, inadequate, broken down sewage system here. Every time we get a heavy rain on the southeast side, it overloads the system and results in sewage getting dumped into the Ohio River because the system can’t handle the heavy rain and sewage at the same time. Fortunately, I live north of the city and on high ground but still have to pay the 35% mandate. The date on the CBS article is March 21, 2014. Think you’re forcing the issue on that one. Now Detroit’s woes are being blamed on global warming; didn’t they used to be Bush’s fault? I was surprised that the rainfall for a given frequency event in Detroit went down, especially since Tech paper 29 included the drought of the 1930’s, and the more recent calculations do not. In Iowa, where I work, it went up. Perhaps the lakes have something to do with it. The study previous to Atlas 14 was around 1990, so it may be another 20 years, though with better data handling, maybe the re-evaluation will be more frequent. I have not worked in Detroit, so I don’t know anything specifically about Detroit. The electric power industry is catching on to the scam. It is Detroit, after all. Where else in the world does a governing body exist that believes climate is an unchanging everlasting guaranteed known? As reported on the local news channel WDIV, another contributing factor is that scrappers removed coppper wiring that provided power to the pumping stations located at underpasses along some of the major freeways. The Detroit area had a similar rain event about 4.75 inches back in July of 1925 when weather data recording was likely done at Detroit City airport. But the1925 rain event was not also global warming? Windsor, Ontario also experienced severe flooding from the Aug., 2014 rain event. The new Herb Grey Parkway in Windsor and now under construction there was also flooded by this same storm as were areas around Windsor. See Windsor Star newspaper for photos of the flooding. Aw, man I wish he had not said that. If the results of these predictions stay true to for, Detroit is now about to have a multi-year drought. For many, weather has only existed since the 1950s. That’s the only way to make sense of their comments. Finally, perhaps a higher power believed Detroit could use a good cleaning. I would agree. Many of Detroit’s main streets have railroad viaducts that flood as the result of heavy rains. Nearly impossible to keep these viaduct drains cleaned out. Result is that main traffic routes these streets provide are closed making it, at times, difficult to get around the city during and after heavy rains. You are right. I’m a licensed land survey and provide FEMA Elevation Certificates and Flood Map Changes (Amendments/Revisions) for property owners. The maps are constantly being updated due to local development. The “100 year flood” means there’s a 1 in a 100 or 1% chance flood waters will reach and certain level within a year. There’s also a “500 year flood” 1 in 500 or 0.2%. When I developed house lots in Oregon the 1990s, the official flood plain maps bore no resemblance to physical reality on the ground. They were apparently drawn with a crayon Back East based upon Lewis & Clark maps. That isn’t far from the truth. The old flood maps were developed from USGS contour maps with a 20 ft vertical interval between contours, with some supplemental cross section surveys along major drainage ways. 20 ft contours do not show much detail in flat flood plains. Maybe the new LIDAR based maps will be somewhat better, but I haven’t worked with them. A good use for LIDAR. New maps are sorely needed. IIRC, a contractor in Houston made the maps for the USGS for the whole country, without any new local surveys, often based upon large scale, antique cartography of dubious quality, so that even a fine pencil mark could cover large swaths, which were often off by even more distance from the features they intended to represent. Does climate change cause copper theft? if yes, then definitely climate change caused Detroit’s major highways to flood. Another man made climate change disaster to add to the list of all man made causes of climate change: copper theft. June 22, 1947….Holt Mo….12 in of rain…..in 42 MINUTES. When looking at plots of the frequency of 2″+ rain in a day, as shown above, it is very important to take into account the TOBS (time of observation) factor. It used to be that the measurements were taken in the late afternoon, but over the decades virtually all stations have been switched to morning measurements. Since heavy rainfall events are very often late afternoon thunderstorms, the old measurement timing was likely to split the storm’s precipitation into two separate days. This is much less common with morning observation. Stormwater piped systems are seldom designed for more than a 20 year storm. In fact, with the advent of storm water retention systems including roof, parking lot, and storm water ponds, local piped systems may only be capable of carrying a 5 year event, with the overland flow carrying up to a 1:100 event. After that, it is between you and your insurer. Buy on high ground. Major/Minor System Concept: An urban area will have two separate storm drainage systems, the minor system and the major system. The minor system consists of the pipe network, plus gutters and inlets which provide a convenience system to rapidly carry away storm runoff from road surfaces for minor rainfall events. The major system conveys runoff rates and volumes for a 1 in 100 year rainfall event which exceed the capacity of the minor system. The major drainage system consists mainly of overland drainage conveyance elements. Minor System Level of Service: Storm mains which service areas of 30 hectares or less are to be designed to convey runoff from 1 in 5 year and more frequent rainfall events. Mains servicing areas greater than 30 hectares are to be designed to convey 1.25 times the rate of runoff which would occur in a 1 in 5 year rainfall event. Ponding Depths: The minor system should be designed such that the depth of ponding in the street does not exceed 0.15 metres in a 1 in 5 year rainfall event. The major system should be designed to limit the depth of ponding in the street to 0.35 metres in a 1 in 100 year rainfall event. Many cities and states are in the same rusty boat, having put off investing in bridges, wastewater systems, dams and other public works that need regular maintenance and upgrades. The American Society of Civil Engineers estimates the country would have to spend $3.6 trillion to get the nation’s infrastructure in decent working order by 2020. ..
Could I suggest that bloggers on WUWT give an indication of their country when using geographical references? It seems that the larger the country, the more likely the commentator is to disregard the fact that readers are spread all over the globe so do not necessarily know which “Windsor” someone may be referring to. Adding “Ontario” or “UK” would be so helpful. Mike, in little New Zealand. Jimmy Carter has the answer: raise your taxes! Man-bear-pig owned a Chevy, once, and that experience of owning one caused man-bear-pig to hold a grudge against the city of Detroit which can only result in man-bear-pig’s wrath being brought against the city. Speaking of “100 year”, after our local flooding last year I was explaining to someone that, contrary to their belief that it was the worst flood in the city’s history, it was actually rated as a “20 year flood”. Their smug, self-assured response was, “That’s not true, there wasn’t any flooding in 1993”. As Bill Engvall would say, “there’s your sign”. I live in the Metro Detroit area and commute through the affected area. I was just glad that 8 Mile road was fully open this morning on my way into work. Yesterday it looked kind of like a zombie apocalypse with all the abandoned cars all over the place. I had to drive through the Ghetto to get back home. One of the problems in this area is all the major highways like 696, I75, M39, M10 are built like ditches with 20 foot tall concrete walls on each side. As you can imagine with roads constructed like that the biggest flooding happened at the lowest points in the system where these road cross and one is forced under the other one. I believe I75 at 696 had about 15 feet of water on it Tuesday morning, looked more like a river than a highway. That area also had multiple bank failures where the earth underneath the service drives were washed away. The event in 1925 and the one in 1926 are both comparable. As I posted at the Washpost, both of those events were caused by the rapid growth of Detroit in the roaring 20’s, especially the large number of new automobiles in and around Detroit which caused local climate disruption. I’m not sure I should have posted that there as some readers might miss the sarcasm. I dont know about Detroit, but in most countries I am familliar with, the local authorities make a careful division between storm water and sewerage systems. This is to prevent the very problem that Detroit appears to be suffering from right now. Storm water, which is relatively clean, is/should be ducted by gutters and pipes to natural storm water channels such as streams, rivers and the sea. Sewerage goes to the sewerage treatment facility. Makes a lot of sense keeping the sewerage seperate from storm water – no chance of flooding – unless residents take short cuts and direct storm water into sewers. Anyway I must say the article confuses me somewhat. Does Detroit actually have sewerage overflowing on the streets or is there just an excess of storm water? Here in Phoenix the older freeways have pumps installed to get rid of the rainwater that would otherwise flood the roads. I wonder if Detroit’s roads also have pumps for the same purpose or perhaps they need to add them. So how do we account for the increasing population in the sunbelt states? If global warming is such an issue, shouldn’t people be migrating out of the sunbelt? “Climate Change” aka weather, is the politician’s dream come true. It can either be a convenient excuse for failure or a reason to grab funds. It’s also a great bandwagon issue, since many people have been stirred into a frenzy by the lamestream sleaze media about “extreme” or “crazy” weather. Thus, they can puff themselves up in importance by appearing to “care” about the planet, and helping to bring our weather back to “normal”. Climate hysteria articles based on whatever is happening outside today. Wasn’t it due to an unusually cold air mass driving the cold front? Back in the 1920’s Detroit had a good public transit system so many did not own automobiles. There is no raw sewage water on the streets. Flooding is from water running off from buildings and paved surfaces into a system that can’t handle that much rain in a short time. Detroit has a network of old railway spur lines that cross city streets. Large amounts of rain flood these railroad underpasses cutting off the streets to vehicle and pedestrian traffic. Creates a traffic nightmare to find a way around these flooded underpasses. This is an old problem in Detroit which goes back years and years and long before Detroit was broke. While politicians and environmentalists are blaming everything including clogged drainage to climate change, it is refreshing to hear that Bjorn Lomborg “the skeptical environmentalist” surveyed 60 eminent economists, including four Nobel Laureates, to list the most serious world problems that needed immediate solutions. Deworming of schoolchildren ranked higher than climate change. LOL Finally economists that made sense! In the US, developments since say 1970 (the timing varies by state) carefully keep storm drainage separate from sewage. As cities installed systems, some were combined systems with both sanitary and storm drainage. If there was treatment, excess flows from storm drainage was bypassed to the waterway. In the 1970’s treatment requirements became more strict and the systems began to be separated depending on whether it was more economical to treat almost all or construct the separation process. It is not an easy task to separate a sanitary sewer system from a storm water system. The process continues to today. As treatment requirements become more strict, it becomes more economical to separate more and more systems. It is in the largest cities, such as Detroit, where the process to separate is the most difficult and therefore has been deferred the longest. Those are also the areas where the whining is the loudest and the political leverage is the greatest. Some of us or maybe just me, need charts explained. Frequency .005 means what? Michigan warming? My relatives will be glad to hear that. My sister and brother-in-law in Grand Rapids MI have not even uncovered their trailered Sea-Doos this summer. Let alone taken them out to any of their favorite spots like Grand Haven. I spoke to them today. “Why bother? It’s too cold”, they said. I’ve been there several times in the summer and it was magnificently warm weather and water temperature. Not so much now. Water only 48 degrees? Air temp low 52 & high of 65? The water temperature in the swimming area of the Grand Haven City Beach is 48 degrees. Sunrise 6:48 am. Partly cloudy and unseasonably cool once again. Cold Lake Michigan water is making it a very comfortable summer, and not much need for a/c. High 65. Low 52. Winds northwest 7-13 mph. Sunset 8:50 pm. The water temperature in the swimming area of the Grand Haven City Beach is 47 degrees. Sunrise 6:49 am. Mostly sunny and pleasant. A little more sun and a little less wind will make for nice conditions. High 68. Low 52. Winds west 7-13 mph. Sunset 8:49 pm. PS: In my 67 years, I can clearly recall six 100 year floods: Judy, Hazel, Camille, Agnes, Floyd and Gaston. There are probably a few more that I can’t recall exactly, but the point is made. So does regular cleaning make the storm water systems overflow (not logical) or is it the clogged drains and storm drain inlets? Detroit has what, 90,000 abandoned buildings? Houses for sale for $1.00? Population has fallen by 1/2 since 1950. When people move out there is no demand for real estate, prices fall, everyone left loses their shirts. The solution? The city government is bulldozing the city. For real. You can’t make this up. Civic improvement in action. they have this mysterious compulsion to seek to blame problems on somebody else rather than to seek solutions. if you don’t do anything you can never make a mistake. only people that actually do something are at risk of mistakes. therefore politicians concentrate of finding error, not on getting things done. This coupled with the less publicised closure of an MOD facility that used a very large quantity of water and as a result did a considerable amount of river maintenance that just stopped when it closed. This in spite of the management warning all the politicians that this would be a severe problem if the responsibility was not passed on properly. The politicians wanted the problems, to be able to blame global warming given the political capital invested in global warming / climate change. @David Cage – Absolutely right. In the Somerset levels, they have put aside a large area as habitat as wetlands. because the climate is getting warmer and the computer says the water fowl will have no where to live. The UK met office predicted a dryer than usual winter, and since the UK Met Office has such an examplary record on predicting weather, the authorities preflooded the aforementioned wetlands. Of course when the rains came, this area was already saturated and could not play it’s part in absorbing the rain to stop flooding. There is also a lot of evidence the UK Gov made a concious choice to stop the dredging that has been going on in teh levels since the Ducth engineers did their stuff in the 17th century to transform them from being marshes. Apparently the silt from dredging operations, which has been spread on farmland for centuries, is now classedby the EU as a waste material and so costs to get rid of the have risen sharply – it can no longer be used to fertislise the land – so the goverment have stopped the dredging on costs grounds. See what an unfortunate combination of idiots in charge can accomplish? This has been used by liar politicians with poor policies since Katrina. The failure to maintain infrastructure now has the perfect ‘Stay’ out of Jail card. It is sufficiently nebulous but also sufficiently accepted by the man in the street to prevent most people looking further. Allow building on a flood plain – which floods – not the planning departments fault – its AGW. Don’t maintain 100 year old coastal defences, that then fail – its AGW. Political Science. Because maths are hard! This problem cannot be overstated. After last Winter’s brutal conditions in the US, caused many billions in additional costs (road repairs, heating bills) it should be obvious that we are flushing multiple billions down the drain each year to address increasing CO2, a beneficial gas that is increasing global vegetative health/plant growth and crop yields/food supplies. Funny, oh Big Ed never mentions that Detroit’s leaders have lined their own pockets for years, raised taxes to the max limit allowed, spent profligately on horribly under-performing municipal services, and chased away their tax base. Nope, he just sticks it to the Gipper! Powerful ‘Big George Shultz’ of Ronald Reagan, Secretary of State and Hoover Institute fame wants Republicans to lead on global warming and carbon taxation. You have to remember that George Shultz and Hoover institute buddies Michael Boskin, John Taylor and Condoleeza Rice selected GW Bush. I’d be concerned about who they pick next. You cannot trust any of them anymore. Mr Fix-it Romney got their backing. Yeah, he’d have fixed it alright. Carbon taxes and war with Iran & Syria costing another 5-8 trillion. We need a third party of skeptics with common sense. Maybe the sewer system was overwhelmed due to the trash, bodies, and rats that are clogging them up? Nature just gave Detroit a good flushing – long overdue. I would recommend Detroit City adopt a periodic maintenance schedule and that the Managers require the workers to accomplish this,. Starting with the pumping stations would be good. If this city were run by private enterprise, periodic maintenance procedures would have already existed. The major part of the problem is that bureaucrats and special interests have learned to game the system. It used to be that infrastructure was the top priority for tax money. But groups like the teachers’ unions, police unions, etc., have learned that they can trade their votes for taxpayer loot. So our tax money goes for ever higher salaries [while test scores stagnate and it takes ten minutes to respond to a 911 call], and the potholes never get filled. Then, when school buildings are falling down from deferred maintenance, the same unions push ballot measures to ‘fix our schools’. The money was always there, but it got intercepted by politicians and diverted into teachers’ pockets in return for votes. Taxpayers need to vote! That is the only thing politicians listen to. If we don’t vote, then the problem will get worse. Other cities will go the way of Detroit. It can easily happen. On what basis do you think there is not already an existing maintenance program? The only indication so far of a maintenance issue is with the theft of pipe from pumps stations along the highway. Those may be the responsibility of the State DOT rather than the City. There has been nothing else other than assertions up to this point about the flooding being caused by maintenance problems. It remains that the rain was above what storm systems are usually designed to handle. Some flooding from such a storm is inevitable regardless of maintenance. More information is needed before it can be concluded that the situation was exacerbated by maintenance issues. Who am I kidding? It is a lost cause. In California the push is on to waste more than $100 BILLION on a stupid “bullet” train. Construction companies and their unionized workers are pushing for it, and taxpayers be damned. The so-called ‘bullet’ train will take 4.5 hours to go from S.F. to L.A. because of all the politically necessary stops along the way. The cost will far exceed the claimed “$103 billion”; the time for construction will double or triple, and fares will never be enough: there will have to be permanent taxpayer subsidies. Worse, there is already an extremely efficient infrastructure in place: airlines. I can fly from S.F. to L.A. in one hour, for about $100. Fares are not subsidized. I have taken airliners on that trip literally hundreds of times. I have taken AMTRACK from S.F. to Sacramento many times, too. Give me planes any time! The system is so broken that nothing short of a revolution can fix it. So, BOHICA, taxpayers. You’re the sheep, and there is more wool there for the shearing. And if a “carbon” tax ever passes, taxpayers will get it much worse — doubled and squared. I had read your previous comment when I wrote mine. It remains that there is as yet no reason to conclude that the flooding was largely due to inadequate maintenance. The rainstorm that occurred was larger than any event that storm sewers are designed to handle. Flooding in such an event will happen even if maintenance is perfect. Most of the cost of maintenance on municipal utilities is labor: i.e. salaries. There is no dichotomy salaries vs maintenance. Salaries are a part of the cost of maintenance. suburbs is all that is left. Detroit is entirely man made! Sewer and Storm are separated, and have been required to be so since the clean water act. And the aforementioned affluent flight to the suburbs over the past 50 years, have caused the city’s coffers (not to mention the damned corruption) to whittle down to nothing, causing the current bankruptcy issues. Global warming isn’t the cause of Detroit’s flooding woes – poverty is. Too many people needs someone or something to blame on……. I’m quite sure the Politicians want to blame “climate change” and further the plan to tax us all with a Carbon tax, they conveniently don’t mention that copper plumbing is missing from the freeway stations used to clear the highways of water, rendering them useless. How were they working “as expected” with no plumbing and does anyone else find it terribly convenient that it was not noticed and repaired before this huge storm? It shouldn’t be surprising how many people have no understanding of what a “100 year flood” means. These people don’t even understand that the chances of throwing a six with a dice doesn’t 6 will turn up every six throws. Is it ignorance or stupidity or politics? Get Nicole Curtis on this case! It feeds her rehab addiction (for rehabbing houses and such) and gives her much deserved media attention. Don’t know what her politics are. Don’t care. She can make mold, rot, and mildew look and smell like roses for the cost of a cup of coffee (like she would need the caffeine).